The Huh? 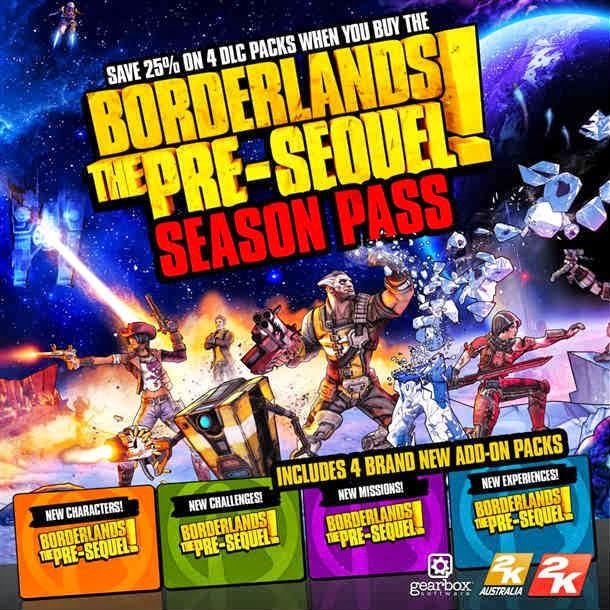 : Borderlands: The Pre-Sequel Season Pass Announced! Borderlands: The Pre-Sequel Season Pass Announced! Gearbox Software and 2K announced yesterday that the upcoming Borderlands: The Pre-Sequel will follow in its Pandoran predecessors footsteps and have a slew of add-on content. Season Pass buyers will get all 4 DLC add-on packs as a bundle that will include "New Challenges, New Missions, New Experiences," and my favorite listing "New Characters!" Each add-on will sell individually for $9.99 or the pass as a whole will be priced at 25% off- so $29.99. As previously mentioned- The Pre-Sequel pre-orderers will get the Shock Drop Slaughter Pit, a typical Borderlands staple of horde wave mayhem hosted by former Dahl military recruiter TR4-NU at an abandoned Dahl facility on the moon of Pandora. Borderlands: The Pre-sequel will be available on Oct. 14th for PS3, Xbox 360, and PC.